Chronic Sleep Deprivation: What’s It Really Costing You? Sobia Iqbal on Chronic Sleep Deprivation: What’s It Really Costing You? Sobia on Chronic Sleep Deprivation: What’s It Really Costing You? Reyes Adelman on Chronic Sleep Deprivation: What’s It Really Costing You? 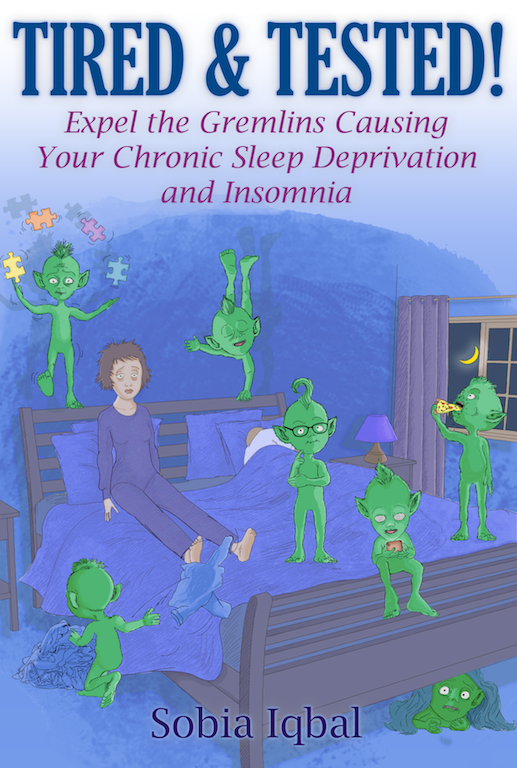 Dimple Norem on Chronic Sleep Deprivation: What’s It Really Costing You? Worried about your lack of sleep? Perhaps you're feeling exhausted throughout the day, can't think straight because of "brain fog" or there's niggling physical health symptoms? Occasional sleep deprivation is normal. However, when it becomes the norm (or chronic), our bodies do warn us. How loud do these warning bells need to ring, before we listen? How different would your life be, if you experienced deep refreshing sleep night after night? The kind of quality sleep you experience on your very best days - that gives you mental clarity, physical energy and emotional well-being. Sad to say, days like these may feel like a distant memory for some of us. Let's put it right. What's the Difference Between Sleep Deprivation and Insomnia? There are many types of sleep disorders - over a hundred in fact! We'll focus on some of the most common here. Not giving yourself the opportunity to sleep despite having the ability to sleep. You experience no sleep or reduced total sleep compared to usual. Typically, this lasts one or two days and the cause may be something obvious like stress, worry or social activity. Most of us will probably experience this from time to time throughout our lives. You're unable to get enough sleep either in length or quality despite having the opportunity to sleep. This is more serious because it’s no longer occasional but persists over a long time. So as we've seen from the sleep explanations above, sleep deprivation is of our own doing. It's a choice we make - not giving ourselves the opportunity to sleep despite being able to sleep. What's the trade-off we're making in terms of our health and wellbeing? Why would we want to do this to ourselves? Here's my top 3 common mistakes and their implications. Fortunately we can easily put these right. Are you willing? Good, let's get started. When you're constantly juggling, trying to carve back time, it's so easy to "dip into" your sleep time. Say for example, you on average get 5 hours of quality sleep per night - whereas, you know you need about 8 hours quality sleep to feel refreshed and energised. That adds up to 21 hours of sleep debt per week, 84 hours per month and a whopping 1000+ hours per year. What is the true cost of this sleep debt on your life? Well, the physical health impact includes increased risk of chronic diseases such as heart disease, diabetes, obesity, cancer and even premature death. From a mental health point of view, sleep problems could be the culprit or a contributing factor to anxiety and depression. It can lead to cognitive decline, especially in later years, such as Alzheimer's disease. There is also the social and economic impact of chronic sleep deprivation and insomnia. More on this as part of mistakes #2 and #3. Sleep is about basic survival just like breathing. Yet, our western culture and lifestyles don't always support sleep. I can't tell you the number of times I've heard people boasting about functioning on very little or no sleep. Dare I say lack of sleep is even "encouraged" or even "expected" especially in the corporate world by way of "putting in the hours". It's just not seen as important enough and this needs to change. It's precisely this kind of short-term thinking (project deadlines etc), that leads to long-term problems (like sick leave due to stress and illness). Many corporate businesses now have Wellbeing programmes and I'm glad employee wellbeing is being recognised as important not least because of the significant impact it has on productivity and performance. Not to sound too cynical but I've seen the "how to manage stress" advice - however well intentioned, it doesn't typically go as far as to look at the underlying causes, including company culture and expectations. This may be in the form of long working hours, socialising after work , especially with alcohol, long commutes or generally travelling a lot as part of your role - all of which are likely to have a knock on effect on sleep. Shift your mindset by adopting this belief: Sleep is very important - quality as well as quantity. Ask yourself: how much sleep on average am I getting per night? Score the quality of your sleep (1 = poor and 10 excellent). This doesn't need to be an exact science - go with your gut feel answer. It's a useful baseline to start from and make improvements. FIGURE OUT WHEN YOU NEED TO GO TO BED to get the quality of sleep you personally need. Do this by waking up at the same time everyday and gradually going to bed slightly earlier each day (10-15 mins). You'll know when you're optimal bedtime when you wake up feeling refreshed and often without the need for an alarm clock! An hour before bed, turn off all your devices, dim the lights and unwind, getting your mind and body ready for sleep. Hot baths and showers are also recommended. Sleep deprivation and chronic insomnia has the potential to impact every aspect of our lives- this is particularly true for our relationships! Ever feel like you're merely "going through the motions" - that you can't fully be present in your family and friends lives. Feel like you're missing out? You try to find more time but never quite do. Or you simply lack the energy to spend quality time with loved ones? How can you give to others when you yourself are feeling depleted? I believe, the most important thing you can do is to address your underlying lack of sleep. This will give you the energy and focus needed for your relationships. Whilst you're doing this, there are some simple yet very effective steps you can take to improve and see noticeable positive effects on your relationships right away. Quality not Quantity - Spending lots of time doesn't necessarily mean better relationships. Carving out quality time on a regular and consistent basis is key here. You're building up the "emotional bank account" as Stephen Covey nicely puts it. This will make your relationships more resilient, supportive and connected. Set an intention for those relationships. For example: "With my daughter I want to have more fun, be more connected and supportive." How can you live these intentions more fully in your most important relationships? Start with your core circle and then apply to your wider relationships. Put quality time in the diary, talk about the kind of quality time activities that you'd both like to do and then go do and enjoy! I'm a strong believer that energy, vitality and general wellbeing are crucial ingredients for creativity, problem-solving, inspiring and leading others. In may seem counter-intuitive but by improving the quality of your sleep along with getting the quantity of sleep you actually need - your personal effectiveness will be multiplied! Sleep is one crucial component along with nutrition and exercise. 60-90 mins burst of Productivity - After a good night's sleep, give yourself a chunk of time - I recommend 60-90 mins to do an important task. Schedule it in your diary, make sure you're uninterrupted, turn off any distractions (notifications/phones) etc. Time yourself if that helps you to build discipline until it becomes a habit. You'll notice how much better your perform - greater clarity, focus and execution . Be sure to take a 5-10 min break doing something relaxing and then get right back to it. You'll be amazed at how simple yet effective this is! TAKE REGULAR STRETCH BREAKS - At least every hour get up from your desk to stretch your muscles (assuming you sit at a traditional desk as opposed to a standing one). This alone will have a positive long-term impact on your health including countering the negative effects of sitting for long periods. Musculoskeletal problems (including back pain, neck and upper limb problems) are one of the biggest reasons for workplace sickness. How Much Sleep Do I Need Anyway? The latest research shows that most healthy adults need anywhere between 7-9 hours of sleep. Surprised? How much sleep are you getting? If you want to delve deeper, read the contents in the highlighted box below. Is this even possible? For a short period maybe, but not in the long term. It's more likely that you feel like you haven't slept at all. Stage 1 of sleep (as you'll see next) is light sleep that may only last a few minutes. If you wake after stage 1, it may feel like you haven't slept at all! Our bodies have lots of natural cycles, including for sleep, This is called the Circadian rhythm, which is our 24 hour sleep/wake cycle. Scientists have discovered that whilst we sleep, our brain goes through several phases of activity. There are 5 stages of sleep with 2 distinct parts: Non-Rapid Eye Movement (REM) sleep (Stages 1-4) and then the REM cycle (Stage 5). The first sleep cycle, typically takes about 90 mins to go through all the stages (one complete cycle). Sleep cycles after that, average between 100 to 120 minutes. Typically, we’ll go through 4-5 sleep cycles per night. Stage 1 - Light sleep where you can easily be woken. Eye and muscle activity slows down. Your brain produces alpha and theta waves. You might feel a sensation of falling followed by your muscles contracting. Stage 2 - Your eye movement stops, brain waves slow down with occasional/sudden burst of activity. Your body temperature drops and heart rate slows as your body prepares for deep sleep. Stage 3 - The start of deep sleep, brain produces slower delta waves, eye and muscle activity stops. Stage 4 - Deeper sleep with brain producing more delta waves, body restores itself, growth and repair of muscles and tissues, building up energy and boosting your immune system. Most difficult stage to wake you up from. Stage 5 - Eyes rapidly move from side to side and remain closed, lots of brain activity, dreaming stage, blood pressure and heart rate increase, shallow and fast breathing. Rapid Eye Movement (REM) in Stage 5 is an important stage for learning and memory. Your brain consolidates and processes information from the day before to be stored in your long-term memory. It's an important stage for focus and concentration. Getting that deep refreshing sleep is key to feeling rejuvenated the next day. Here's to You Experiencing Refreshing Deep Sleep More Consistently! Implement the actions steps recommended above and let us know how you get on in the comments section below. More to Sleep Than You Thought? For me too - especially when I first delved into this topic, which was more out of necessity rather than curiosity. You see, I struggled with chronic insomnia on and off for about 10 years. After a lot of trial and error, I've discovered and formulated my Deep Sleep Toolkit, which helps me to consistently get the rejuvenating quality and quantity of sleep I need to perform at my best in a sustainable way. Ready to Start Your Journey? Purchase Your Copy Today! Disclaimer: This blog is for information purposes only and must not be construed as professional advice. Posted on July 1, 2018 December 25, 2018 Tags acute insomnia, chronic insomnia, chronic sleep deprivation, deep sleep, easily sleep, exhaustion, fatigue, how much sleep do I need, insomnia, no sleep, quality sleep, REM cycle, sleep, sleep better, sleep cycle, sleep deprivation6 Comments on Chronic Sleep Deprivation: What’s It Really Costing You?